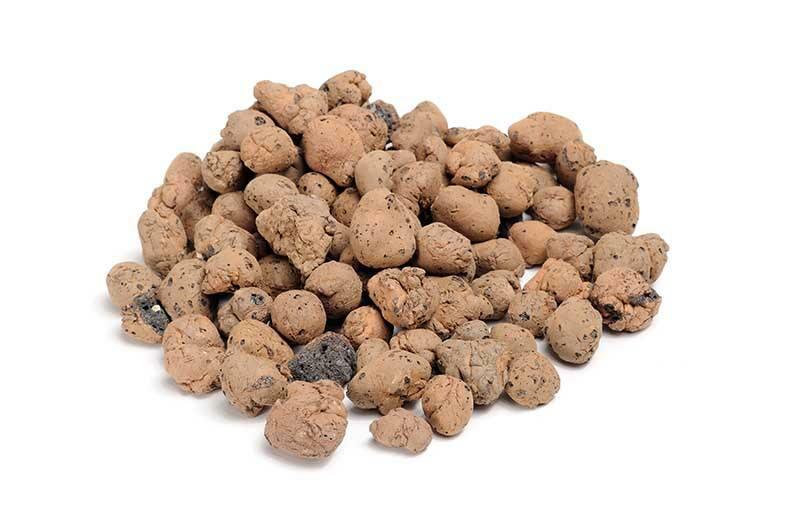 Hydroton is a soil-less hydroponic growing medium composed of expanded clay pebbles that can be used in both hydroponic and aquaponic systems and are one of the most popular growing media chosen by hydroponic and aquaponic growers. It's sterile, lightweight, easy to harvest, and transplant, so it can be used in almost any hydroponic system - wicking, deep water culture, ebb & flow, etc. Hydroton is a soil-less hydroponic growing medium composed of expanded clay pebbles or pellets about the size of marbles or peanuts. The clay pebbles can be used in both hydroponic and aquaponic systems and are one of the most popular growing media chosen by hydroponic and aquaponic growers. It's sterile, lightweight, easy to harvest, and transplant, so it can be used in almost any hydroponic system - wicking, deep water culture, ebb & flow, etc. Oxygen is crucial to your roots and a lack of it will only result in root rot and other undesirable conditions. Fortunately, hydroton provides plenty of air to your roots, the clay rocks are a loose media, so it’s easy to transplant and pull plants out of after harvest and rarely becomes clogged or blocked, so water drains very effectively. This results in it not having a great water holding capacity, so it's better to have a hydroponic system that irrigates/waters regularly. Which makes it a great option for ebb-and-flow systems and aquaponic media bed systems. Hydroton is pH neutral so you can rest easier when finding the proper pH balance. If you want the water to drain around the roots to aerate them, leave the pellets whole. You can use Hydroton alone or mix them in with soil. A 30 - 70 (30% percent of hydroton, and 70% for soil) works great in improving the water-holding capacity of the mixture. Place material at the bottom of your growing container below the soil layer to improve the drainage. Hydroton is a mineral and not considered a pollutant, since not much clay is used to make a cubic foot of clay pebbles, and clay is abundant, most people consider it an environmentally-friendly medium to use. The hydroton is reusable almost indefinitely just make sure to remove all nutrients and organic material from them by cleaning them out with isopropyl alcohol. You should also make certain to rinse them thoroughly with pH balanced water before you put them back in your buckets or grow trays.